Rug Shine in Woodbridge VA, rugs and carpet cleaning service, offer quick and complete pet odor removal services. Urine odor can be cleaned and deodorized with their Skunk Odor Control & Urine Bio Enzyme Odor Encapsulation. 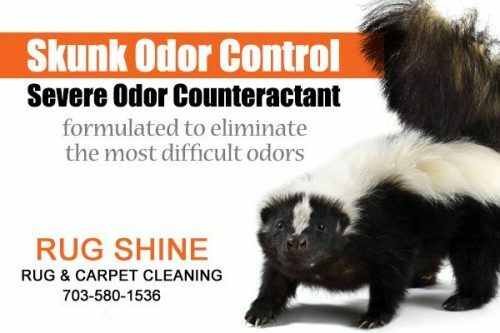 Rug Shine in Woodbridge VA announced their effective pet odor removal services with their new product Skunk Odor Control & Urine Bio Enzyme Odor Encapsulation. Quick response time and thorough attention to detail are the hallmarks of their work. In any home with a pet, odor from accidents, pet hair and pet food are unavoidable. This becomes a bigger problem when a young pet is being house trained. Once the pet has marked an area of the house with urine, it will repeatedly go back to the same spot to urinate. The experts at Rug Shine can pinpoint, clean, sanitize and deodorize the spot before patterns develop. In addition to a host of other services Rug Shine also offer free inspections for rugs and carpets in Woodbridge and the surrounding areas. Inspections include measuring and inspecting stains and other damages, assessment of the required cleaning process and a price quote for the entire project. Rug Shine uses high-quality equipment and machines and eco-friendly cleaning products. Only certified green products are used for rug washes and carpet, upholstery, and tile cleaning. Rug Shine clearly understands the dangers caused by inhaling or coming in contact with volatile organic compounds in even small concentrations. Long term proximity to these chemicals adversely affects human and animal health. Those who suffer from asthma or are sensitive to chemicals are particularly liable to be affected. In addition to ensuring that rugs and carpets last longer, Rug Shine’s long term goal is to create ‘lifetime relationships’ with every customer, so their health and well being are a top priority. Rug Shine is a certified green company. This Woodbridge, VA carpet cleaning company offers a broad array of services ranging from water and flood damage and wool, carpet and furniture cleaning to odor and grout removal and tile cleaning. They offer a 100% guarantee and if the customer is not satisfied they are willing to clean again or offer a refund. They also offer discounts for additional services requested on the same day.